Flat in Cerdanyola. Precioso piso en cerdanyola!!! Flat in Via Europa-Parc Central. ¡parking y trastero opcionales! Find the whole up-to-date range of property in the Maresme region on habitaclia.com. 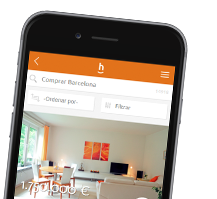 Come to habitaclia.com property portal and see the most complete and detailed lists of flats in the Maresme region, you will find what you are looking for. We put at your disposal the alerts service for flats in the Maresme region.